I would like to share this true story of my life with the most wonderful horse, “Splendid’s Last Creation SF. In 1998 I had purchased an Appaloosa from a fellow in Pennsylvania. He was a beautiful horse and I was so excited to ride him. I had a horrible accident with this the horse. He reared I was bedridden for over a week. A friend of mine offered to take the horse back to the original owner and find me another horse. The next day he knocked on my door. He said I have another horse for you. I was so excited and struggled to get out of bed to see my new horse. He opened the trailer door and there stood Splendid. I can remember him turning around in the trailer looking at me. I was so excited and could not wait until I was able to go to the farm and be with him. At the time , Splendid was just 4 years old and so beautiful. He was everything that I had wanted in a young horse. I rode him every day and on the weekends. We went on so many trail rides alone and became one. I was boarding him at a small farm and decided to move him to a larger facility, but I had no trailer. No worries, we just saddled up and rode about 4 miles to the new farm. He rode like a Champ. TROT – TROT - TROT and away we went. He always took care of me where ever we rode. Through the years we spent many enjoyable hours together and developed such a great bond. I used to ask him to kiss me by holding my face close to his muzzle and bring my face to the left and right of his muzzle. I would say to him “ Snuggle Puggle” “Snuggle Puggle” "Snuggle Puggle". He would pucker his lips out and kiss me. All of the boarders use to watch us. One year for his birthday he got a cake baked with his name on it. We shared his birthday celebration with the boarders. Splendid also enjoyed fries from McDonald’s. I always made it a point to stop and bring him fries when I went to visit him. I met my husband in 2002 and he wanted me to have Splendid at our home with me. We purchased our farm in Frederick, Maryland. We got to spend even more time together. 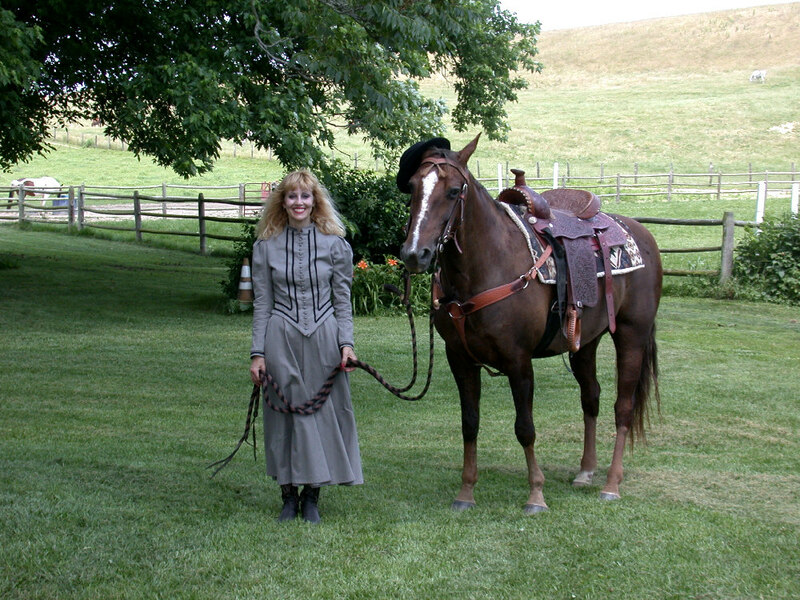 In 2009, I was invited to the Frederick Fair breed show for the American Saddlebred horse and I took Splendid for the exhibit. In the winter of 2011, he started slowing down and it became evident that something was wrong besides old age. I had my vet out many times and they said they thought he had cancer, weakening and could barely walk. As time went on Splendid started hanging closer to me more than ever in his life, and wanted to be by my side, and not even be in the upper pastures with the other horses. I called my vet and they said to me "Bonnie its time" … and my heart was broken. There is nothing any worse than losing the horse that made your life complete. For his 25th birthday I wrote a song for him. I started working on this song in November 2015 and finished this March. The name of the Song is ( My Saddlebred ). My American Saddlebred in my Life, because without The American Saddlebred Horse there is no horse. I purchased Splendid in July 29, 1998.